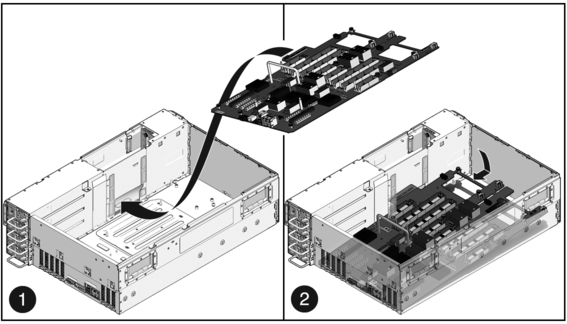 Ensure that all 14 captive screws in the motherboard are retracted. Lower the motherboard down into the chassis. Guide the flex cable connector through the midwall partition. Secure the No. 2 captive Phillips screws. Lower and secure the midwall partition. Install the six No. 2 Phillips screws that secure the bus bar assembly to the motherboard. Install the CMP/memory module bracket. The bracket is secured with six No. 2 Phillips screws. Plug in the auxiliary power cable to J9803. Plug in the flex cable connector to J9801. Plug in the front I/O cable to J9901. Note - Install all four fan trays. Note - Install all CMP and memory modules.